May 13, 2010 - On Wednesday morning about 6 AM Afriqiyah Airways A Libyan airliner Flight 771 crashed on landing at Tripoli International Airport, Libya killing all onboard except one child. It has been reported that the Airbus A330-202 was carrying 104 onboard. That is 11 crew members and 94 passengers. The 10-year old Dutch boy was transported to a Tripoli hospital where he underwent surgery. Medical personnel have reported his condition was not life threatening. "The boy suffered broken legs and was injured in the head," a hospital official told reporters after the child came out of the operating room. It was reported that the 8 year old child, Ruben van Assouw had been traveling with his parents, Trudy and Patrick van Assouw and his 11 year old brother Enzo. Afriqiyah Airways, Flight 771 had departed Johannesburg International Airport about 10 PM and had arrived Tripoli International Airport nine hours later. Flight 771 was on its final approach when it crashed just short of the runway. Flight 771 was scheduled to land and then depart for Gatwick Airport, London, United Kingdom. Afriqiyah Airways was an inspiration that has come to materialize the dream of linking the African countries directly with one another, hence the name Afriqiyah which stands for African, and without the need to suffer through the long connecting flights from Africa to Europe and then back to Africa again. It was also a means of breaking the monopoly imposed by the international carries that controlled most of the mail services and air cargo operations on the continent. Afriqiyah Airways operates an all Airbus fleet. It started its operations with five leased planes and then signed a contract with the Airbus Company during the Paris Flight Exhibition in 2007 for the purchase of 11 new planes including the 5 (A-320) and 6 (A 350) models in addition to the right to purchase 4 further types of the same plane. 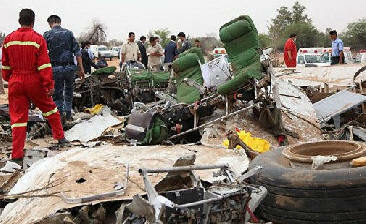 Weather conditions above the airport were very poor at the time of the crash, said an Afriqiyah staff member. Low-hanging clowds had reduced visibility. Witnesses reported the aircraft broke apart while it was on its approach, ?it exploded on landing and totally disintegrated". Officials have retrieved the two ?Black boxes.? Airbus has sent a team of investigators to the crash site to assist with determining the cause of the crash. An well known Irish writer, Bree O?Mara, author of ?Home Affairs? was reported to have been a passenger onboard. Afriqiyah Airways purchased the Airbus A330-202 back in September 2009. The aircraft was last serviced on March 5th by German airline Lufthansa and has only flown since that time 1,586 hours. The Dutch Foreign Minister Maxime Verhagen reported the death toll numbers may drop because the numbers that have been reported are from the booking of passengers and not from the actual manifest of those who actually boarded the flight. It has been reported that 59 Dutch , 7 South Africans, 2 Libyans, 2 Austrians, 1 German, 1 Zimbabwean, 1 French, 2 British, 17 Unknown (to be notified upon confirmation), and 11 Crew members (Libyan nationalities) were onboard. Afriqiyah Airways is working together with the South African immigration and airport Authorities to determine the exact identities and nationalities of the passengers on board of flight 771. The Airbus A330 was cleared for runway 09. Due to poor weather conditions the aircraft should have been given runway 27, as this runway was equipped with and Instrument Landing System (ILS) said Benno Baksteen, a former pilot and chairs a Dutch aviation association. "That would have made more sense. ?It would also have put them closer to the passenger terminal." It has been reported that a member of Afriqiyah Airways had stated ATC at Tripoli International Airport will typically direct morning aircraft arrivals to runway 09, regardless of wind direction and conditions. From the tower if aircraft are arriving to land on 27 the air traffic controllers have the rising sun from the east in their eyes and they prefer to avoid those conditions. The lack of a fire upon impact could mean that the Airbus A330 was very low on fuel or ran out of fuel on its final approach. Several parts from fuselage was found behind the direction of the aircraft raising speculation that the Airbus may have done a cartwheel on impact which would suggest the pilot was in a bank rather than a level flight and may have attempted a go around just feet above the ground with the wing clipping the ground as the pilot was in a turn. The National Transportation Safety Board is dispatching a team of investigators to assist the government of Libya in its investigation of an accident involving an Airbus A330- 200, which was equipped with General Electric CF6-8E1 engines. As the State of design and manufacture for the engines, NTSB Chairman Deborah A.P. Hersman has designated Senior Air Safety Investigator, Lorenda Ward, as the U.S. Accredited Representative. The U.S. team will also include an NTSB engines specialist as well as technical advisors from the Federal Aviation Administration, and General Electric. The team is expected to arrive on Saturday afternoon. The Bureau d'Enquete et d'Analyse (BEA) of France, representing the country of manufacture of the airplane, has also sent a team of investigators to Libya. The investigation is being conducted by the Libyan Civil Aviation Authority, which will release all information on the progress of the investigation.